343rd day of the year. There were then 22 days left in 2018.
on the 50th week of 2018 (using US standard week number calculation). 79th day of Fall. There were 12 days left till Winter. December 9, 2018 was the 8th day of Hanukkah (Jewish Observance). 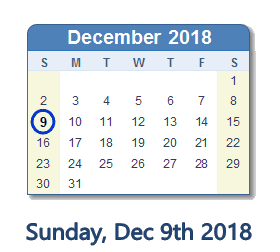 What happened on December 9th 2018?